No internet access? If you're looking to start your own Rural Internet or Municipal Wireless Internet Business, our Products are Cost-Effective Broadband and Telecom Solution ideal for long-range deployment. Are you looking for ways to connect to the internet? Install security surveillance cameras? Automate you business? Deploy a community wireless internet hotspot? Chances are, you are a looking for a solution. In this world of increasing reliance on the internet, delivering broadband high-speed internet access is indeed a big challenge. Especially if you're situated in areas with limited telecommunication facilities. Chances are, you are a business owner and/or ICT-planner wanting to expand your existing local area-network. Chances are, you are an executive of a municipal/town with a vision of modernization thru linkage and networking of offices and sub-units for efficient operation; with plan to implement on-line security monitoring. Of course, you need to connect your town to a public network known as the "internet" for accessing valuable-information over the web. and wireless enthusiast looking for long-range wireless solution. Or an entrepreneur shopping for "cost-effective" WISP equipment kit. Are you looking for a new niche business market? 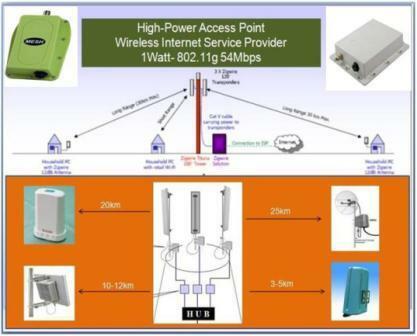 Have you consider the demand in remote areas for high-speed wireless internet, wireless remote access, long-range security surveillance and other solutions needed by remote households, ranchers, farmers, villagers, mining companies, telecentres and businesses-enterprise for company LAN expansion? We offer cost-effective wireless communication solution to get your job done effectively. Learn how to deploy your own indoor and outdoor network, telecom solution, wireless internet business system and service. We make it easy for you to launch your own wireless system. Our startup solution is easy to deploy. The word “cost-effective” means profitable; representing a return on investment of more than the cost. An idea, an answer, a service or product designed to solve a particular requirement or need, problem or situation whose benefits, advantages far outweights the cost of acquiring the service/product. A “cost-effective solution” should be able to help an organization derive savings plus tangible and intangible benefits such as improving business efficiency, productivity and profits. Let us offer you what we consider as the cost-effective solutions to your wireless implementation requirements. XLIN long range wireless product & solutions are designed to serve diverse wireless application requirements and at a fraction of a cost of high-end products. Our products are widely used worldwide with great success helping private, public and government institutions attained a certain level of connectivity. Budget Buster series : indoor USB cost for outdoor long range application !! Chat with a Consultant now! Click on Live Help Icon.